Lima Memorial Health System heart attack survivor Libby McKean is reunited with the Lima Memorial Health System medical staff who saved her life in June 2018 at the Heart Recovery Reunion at Lima Memorial Health System Monday. LIMA — The Lima Memorial Health System medical team and Lima area emergency medical services were honored Monday at the Heart Recovery Reunion for saving the lives of two Lima-area residents at Lima Memorial. 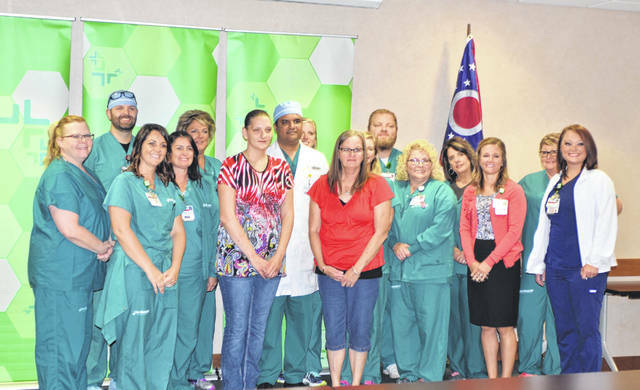 In June 2018 Nick Freistuhler, of Wapakoneta, and Libby McKean, of Harrod, were both admitted to Lima Memorial Health System after having a heart attack. McKean was on her way home from her aunt’s funeral when she had a heart attack only 40 feet away away from her home. Freistuhler’s experience was totally different. He was on his way in the house from his garage when he almost passed out while experiencing a heart attack. Instead of calling EMS, his wife drove him to Lima Memorial Health System. Both patients were treated by Lima Memorial interventional cardiologist Dr. Zane Dean, who implanted Impella heart pumps into their hearts. The Impella heart pump is designed to temporarily support the pumping function of the heart by independently pumping 3.5 liters of blood per minute for the patient. “Through the amazing care of our cardiac team, coupled with this innovative heart pump, we are able to save lives when traditional measures fail,” Dean said in a news release. Dean and other Lima Memorial Health System medical staff were recognized, and EMS staff from Perry Township Fire Department and Wayne Township Fire & Rescue were presented certificates for helping save the lives McKean and Freistuhler during the reunion Wednesday. https://www.limaohio.com/wp-content/uploads/sites/54/2018/10/web1_Lima-Memorial.jpgLima Memorial Health System heart attack survivor Libby McKean is reunited with the Lima Memorial Health System medical staff who saved her life in June 2018 at the Heart Recovery Reunion at Lima Memorial Health System Monday.